The most important thing to do before you start to shop for bedroom furniture is measure your room. When determining the right size furniture for your home, have a look at the space you have to work with and determine the style of furniture you desire. The next step is to establish the style you want for your new bedroom furniture. Have you always dreamed of a stately, traditional sleigh bed? Would the simple, clean lines of modern furniture express your trendy style perfectly? Or do you prefer pieces that are more in-between? Contemplate how the new furniture will blend with the style of your bedroom and any other furniture, fixtures, or decor you plan to keep. Before you fall in love with a particular style of bed, try to think about what kind of headboard and footboard options are best for you. Would a high headboard be blocking a window? Would a low footboard give your long legs more room to stretch? Do you despise having to tuck the blankets in neatly at the foot of your bed, making a high footboard an appealing option? Thinking about these things ahead of time will help narrow your search for furniture. Buying new bedroom furniture provides the perfect opportunity to re-evaluate not only the style of bed you prefer, but the size as well. If you’ve determined that a different size would better suit your needs, just remember to include a new mattress in your plans. Aside from a bed and mattress, nightstands are arguably the most important pieces of bedroom furniture. Think of them as a necessary extension of your bed. Nightstands provide a convenient location for bedside lamps, as well as a place to keep items such as phones, books, or alarm clocks within arm’s reach. You’ll need two nightstands in a master bedroom—one on each side of the bed—so be sure to allow adequate space for both. While shopping for furniture, you may come across both nightstands and beside chests. What’s the difference? While both are similar in width, nightstands are typically shorter and often include a combination of drawers on top with either cabinet-style doors or open space below. Bedside chests are taller and normally have several single-column drawers for storage. With all these options, how do you know which pieces are best for your room? Many times, it comes down to space and what works best for your storage needs. Chests are normally taller than they are wide, making them a great option if you have limited floor space. Varying in height, they normally include between 5-7 drawers stacked in a single column. Dressers are wider than they are tall, and they pair well with a mirror above them. Dressers typically have 2-3 columns of drawers, ranging from 3-4 rows of drawers per column for a total of 6-9 drawers. Dressers work better than chests when they need to be shared by two people, since the columns make them easier to divide. If you have the space, individual pieces can sometimes be placed together to form one large unit, as shown in the photo accompanying this article, where a six-drawer chest is flanked by two lingerie chests for a total of 18 drawers. Media chests are a great solution for bedroom TV storage, and they typically include space for a DVD or Blu-ray player, as well as openings to accommodate cords. Media chests are usually shorter than regular chests, keeping your TV at an ideal viewing height. If you don’t have space for a media chest, another option is to mount a TV above a dresser or media shelf. One of the many benefits of buying handcrafted hardwood furniture is the ability to customize it. At Meyer & Ferreira, we offer a variety of pieces and sizes to fit your specifications. We also offer a variety of wood species, as well as stains and finishes, to create a custom look that suits your personal style. 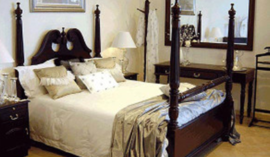 Take a look at all the bedroom furniture options on our site, and then contact Meyer & Ferreira.